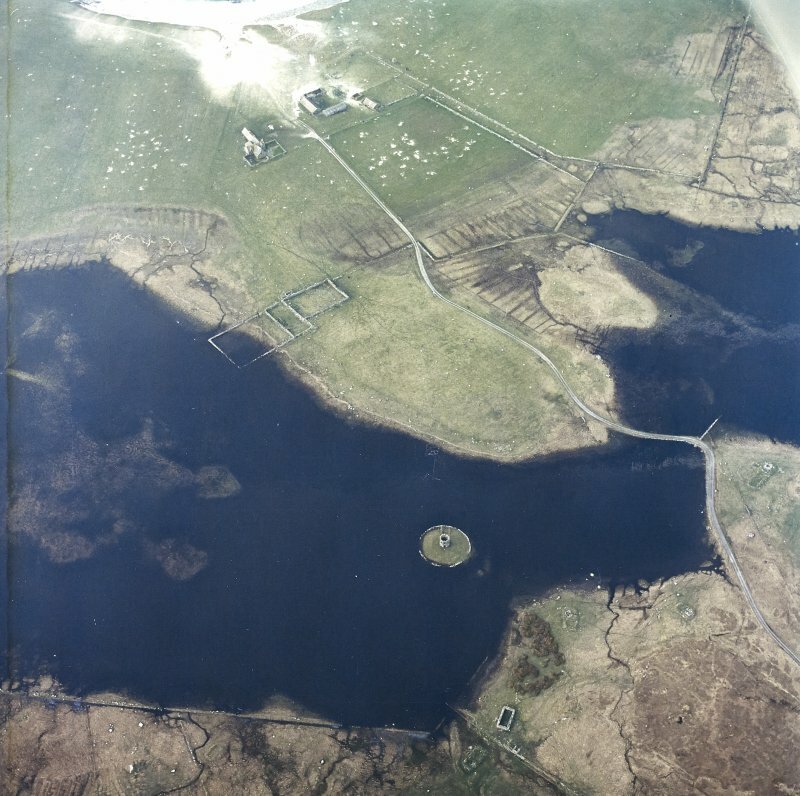 Oblique aerial view centred on the tower and remains of the dun with the remains of the township adjacent, taken from the ESE. 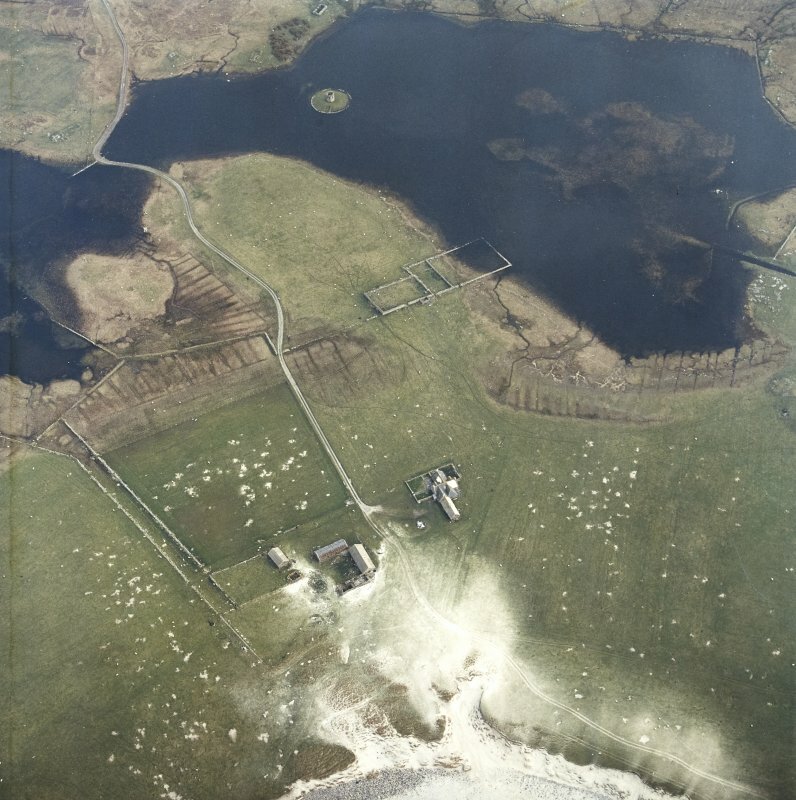 Oblique aerial view centred on the farmstead and house with the tower and remains of the dun adjacent, taken from the NNW. 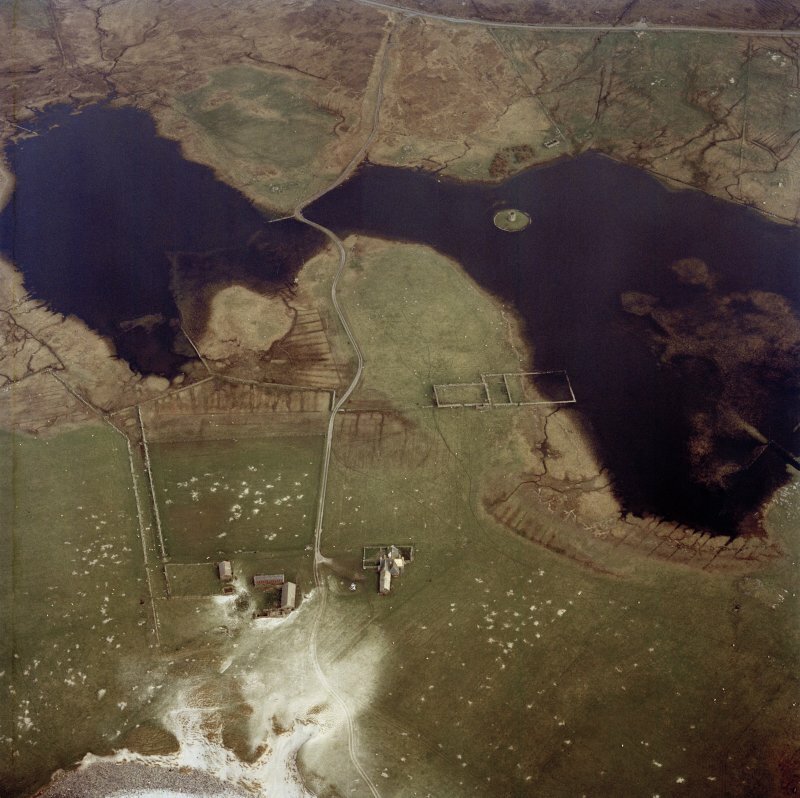 Oblique aerial view centred on the tower and remains of the dun with the remains of the township adjacent, taken from the S.
Oblique aerial view centred on the farmstead and house with the tower and remains of the dun and township adjacent, taken from the NW. 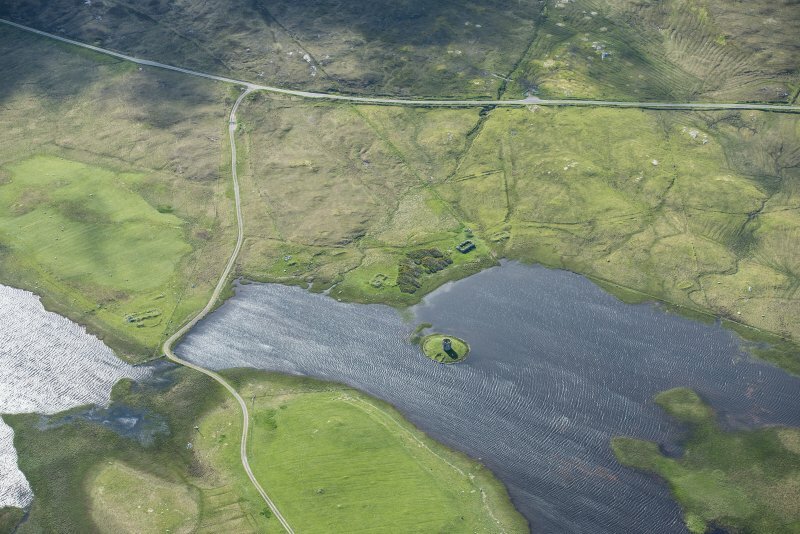 Oblique aerial view centred on the tower and remains of the dun with the house, farmstead and the remains of the township adjacent, taken from the SSE. Oblique aerial view centred on the tower and remains of the dun with the remains of the township adjacent, taken from the SE. 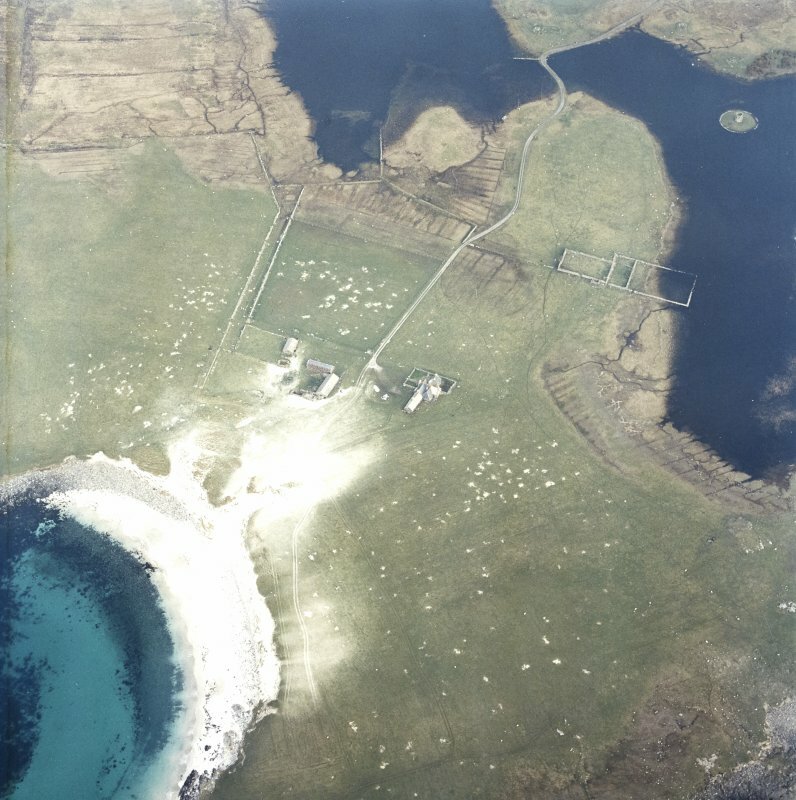 Oblique aerial view centred on the farmstead and house with the tower and remains of the dun adjacent, taken from the WNW. 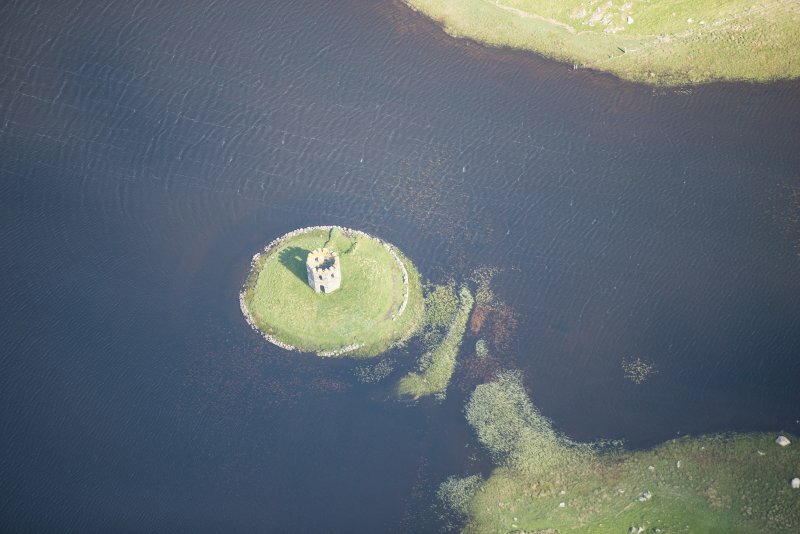 Loch Scolpaig Folly, 1830s Octagonal tower crowning a small islet, built on the site of the Iron Age broch of Dun Scolpaig by Dr Alexander Macleod (an Dotair Ban), who drained the loch. 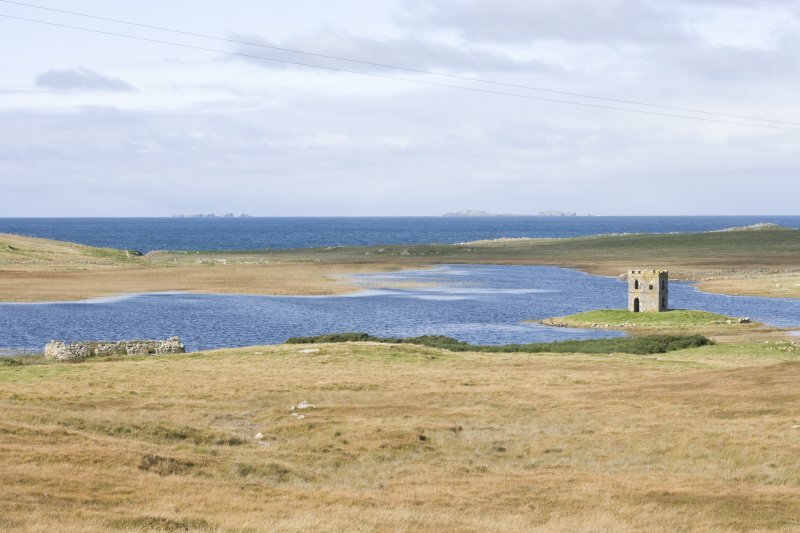 (NF 7310 7503) Dun Scolpaig (NR) Tower. 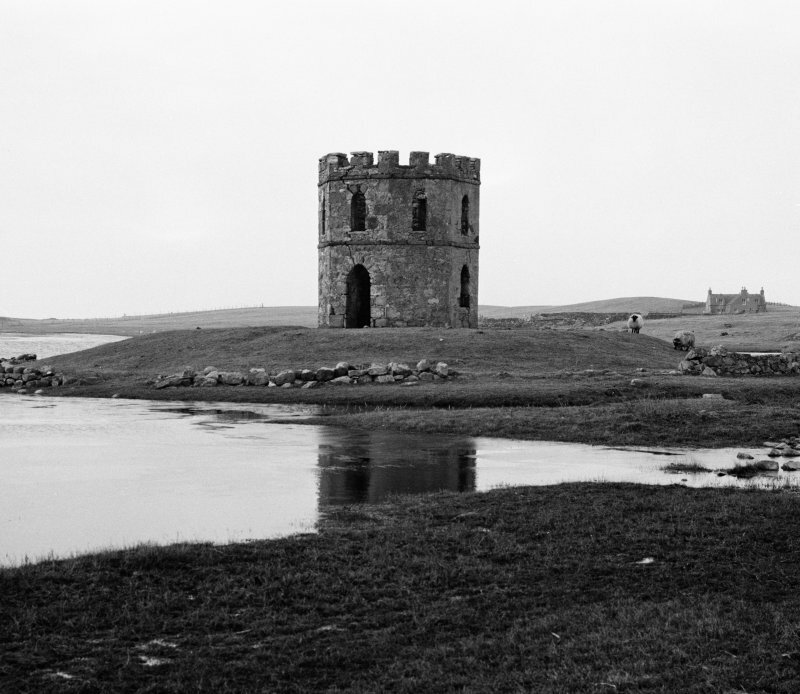 'Dun Scolpaig has now entirely disappeared, its site being occupied by a small octagonal tower surrounded by a low wall at the water's edge. 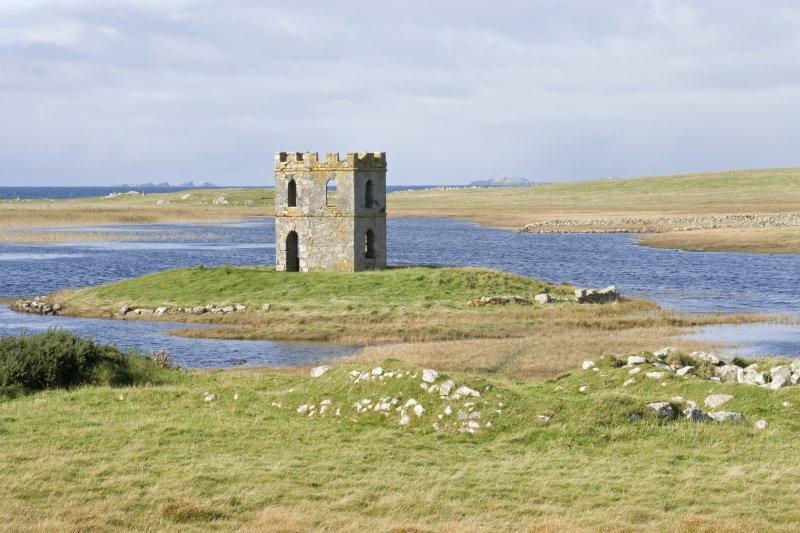 Both of these constructions are of modern origin, being constructed of stones from the fort itself; having been erected by Dr Alexander Macleod about the year 1830'. 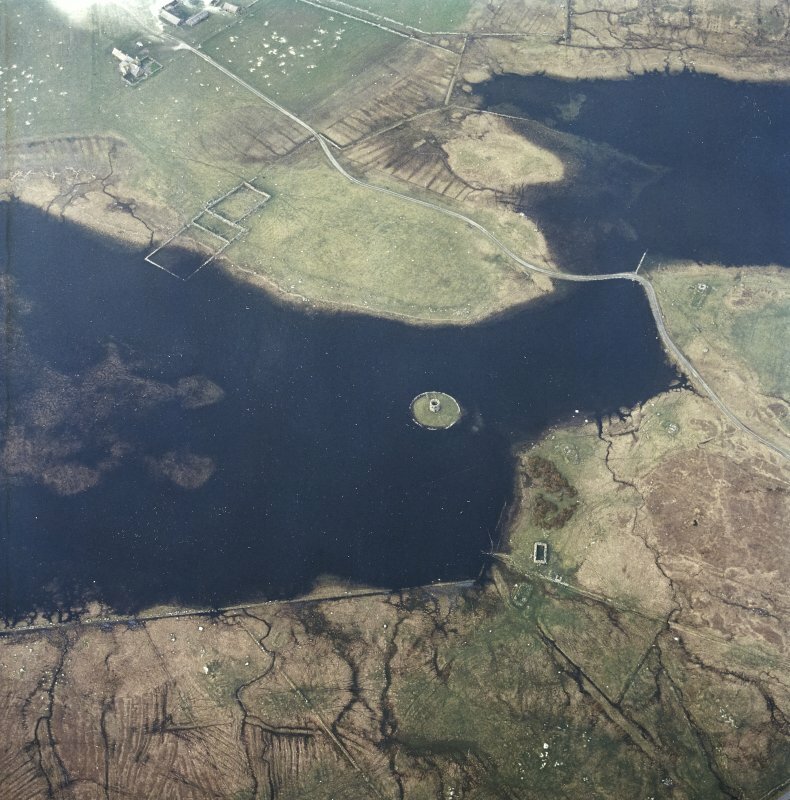 Visited by OS (J T T) 19 June 1965. 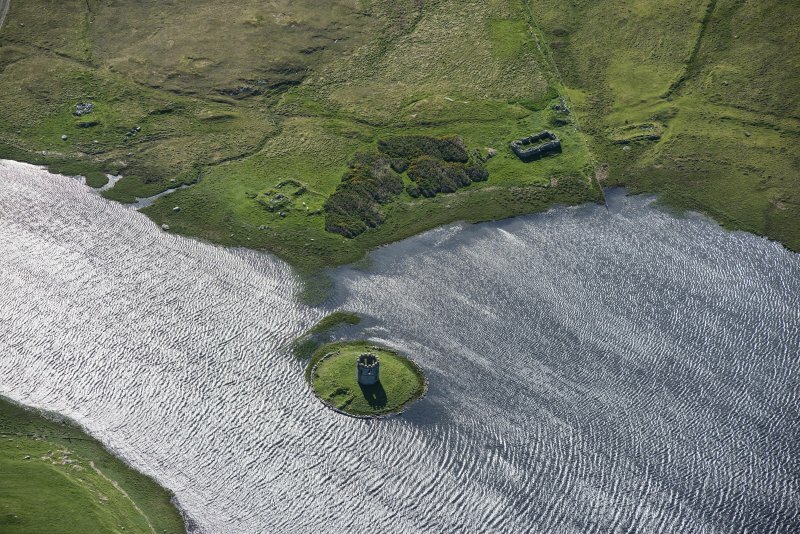 NF 7310 7503 A desk-based survey and non-invasive assessment was made of the site (NMRS NF77NW 6), in association with Simpson & Brown Architects, including a survey of the island and the approach, both of which were heavily landscaped. 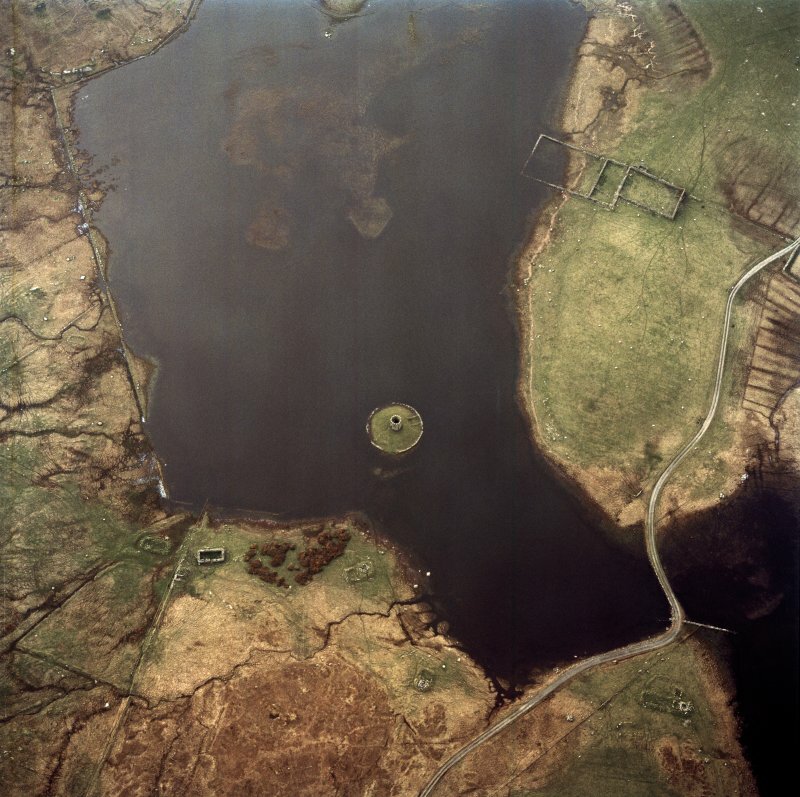 Probable site of crannog - no remains identified. 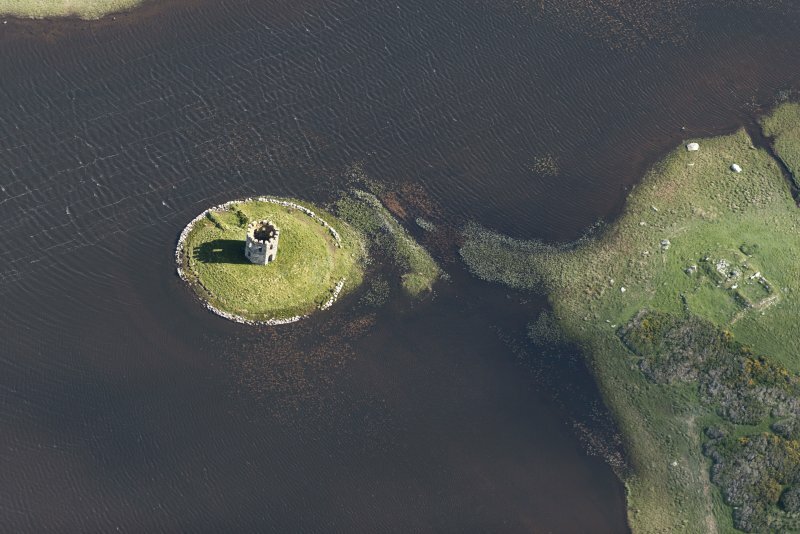 NF 7310 7502 A survey of the causeway was carried out 18–21 June 2008 for Access Archaeology as part of a wider project, supported by Archaeology Scotland’s Adopt-a-Monument scheme, to conserve the tower and make the site accessible as a visitor attraction. 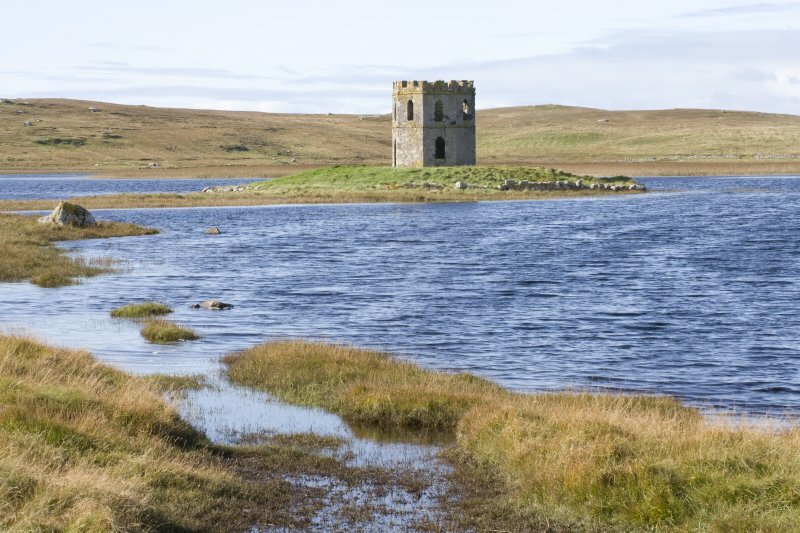 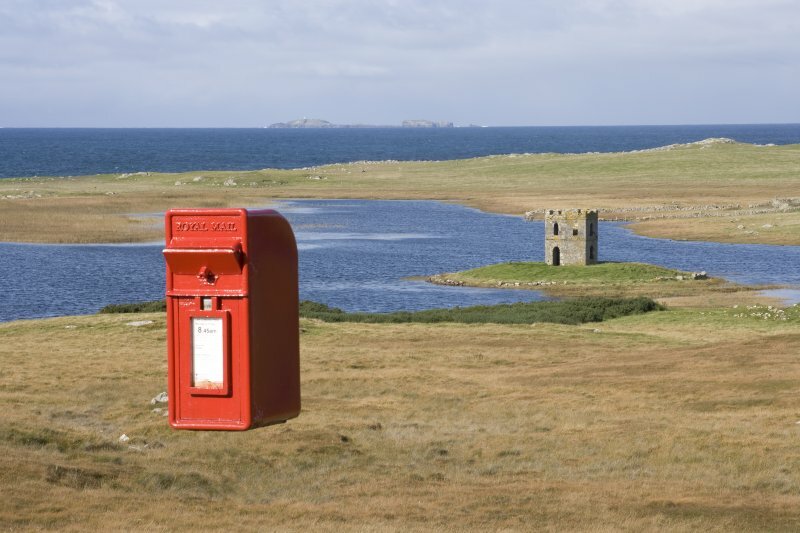 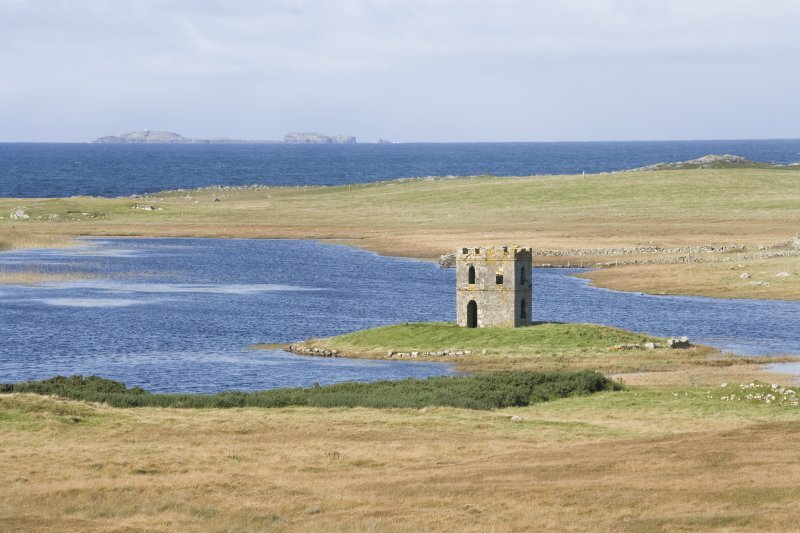 Scolpaig Tower is a 19th-century folly situated on a small islet within Loch Scolpaig, Uist. 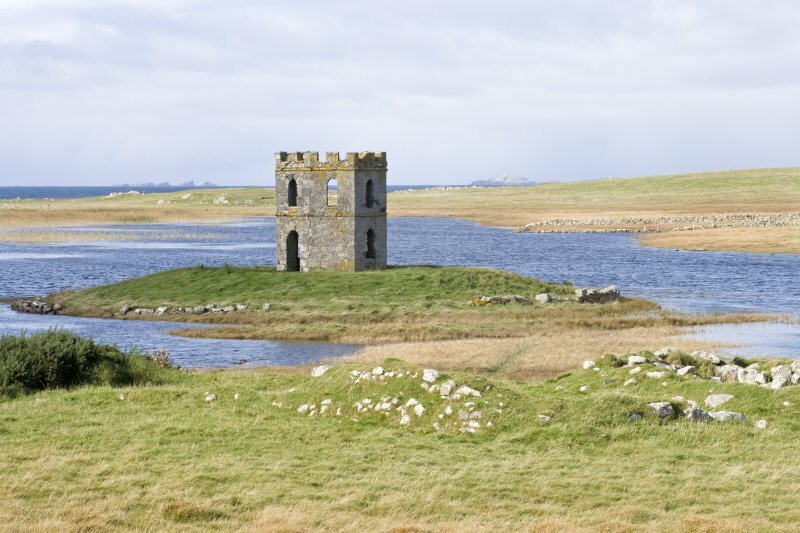 It is likely that the folly overlies the remains of an earlier historic and/or later prehistoric dun. 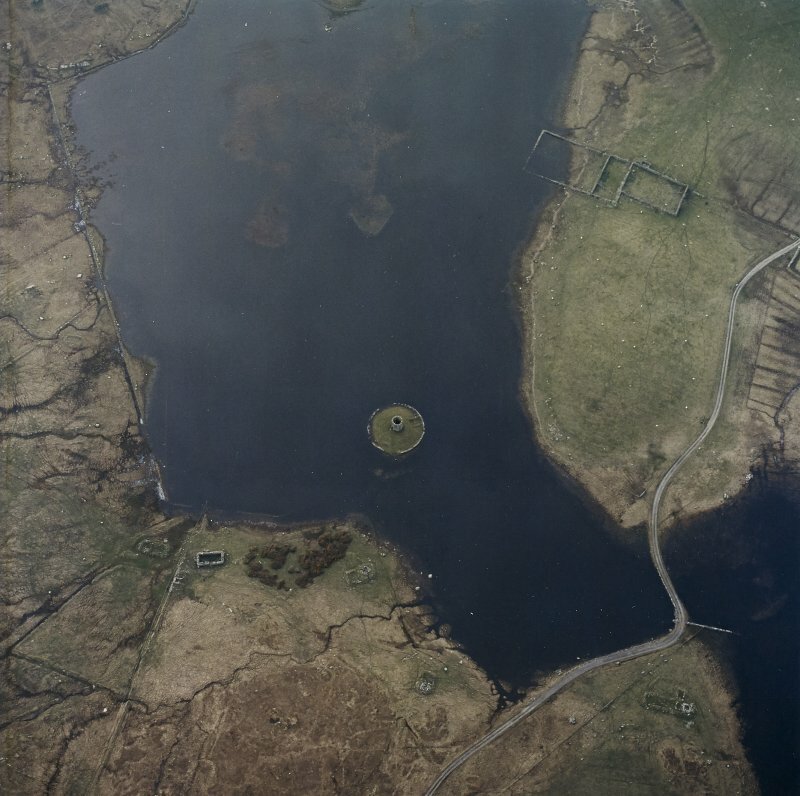 A 1:20 plan, a photographic record and a detailed description of the remains were produced prior to restoration work. 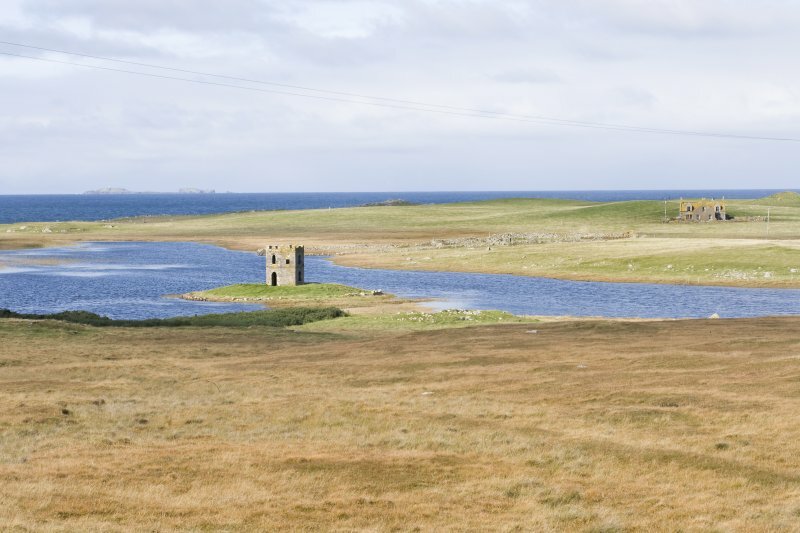 gravel. 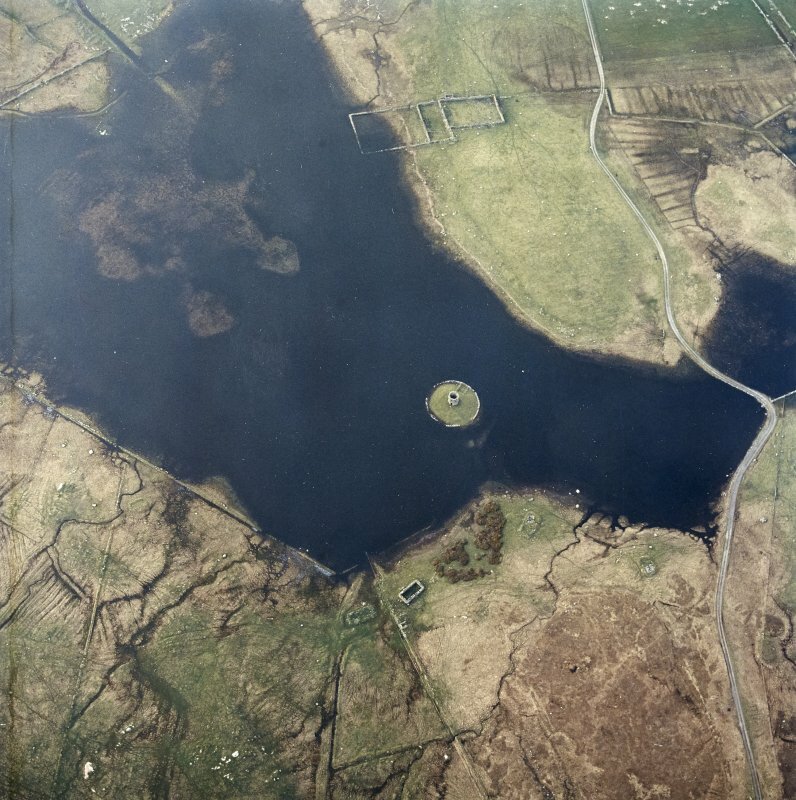 Only one area of the causeway formed a continuous and compact surface. There was no firm evidence of multiple construction phases. 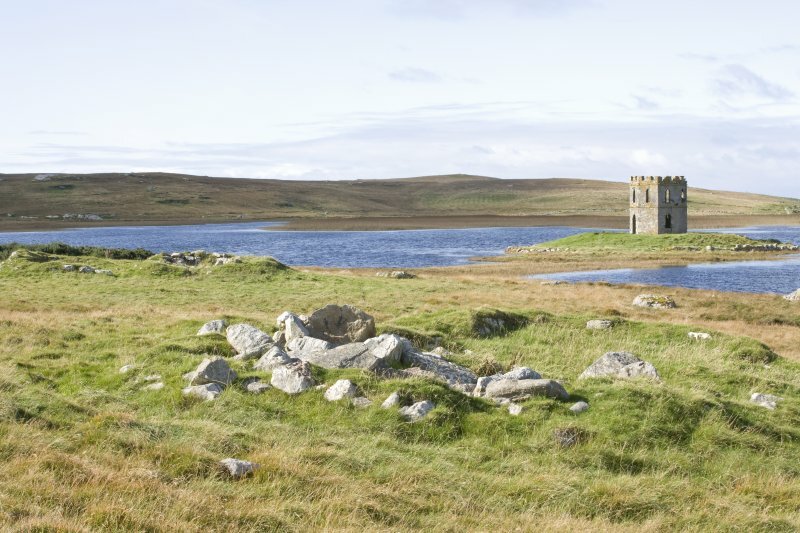 No finds were recovered.